In between design team assignments, I had a chance to play with My Mind's Eye Cut & Paste Adorbs. This is a super fun, colorful collection and it worked perfectly with Alexa's lime green sweatshirt (and her personality). There are some Pebbles products mixed in here, like the flower bouquet, "hello" tag, heart rub ons and the banner papers as well as a bunch of other odds and ends. I even managed to add in bits of washi tape. At the rate I use it, my stash is going to last forever! this is so amazing!! love it lisa! i saw this collection and fell in love with it but with boys too much pink! you rocked it!! 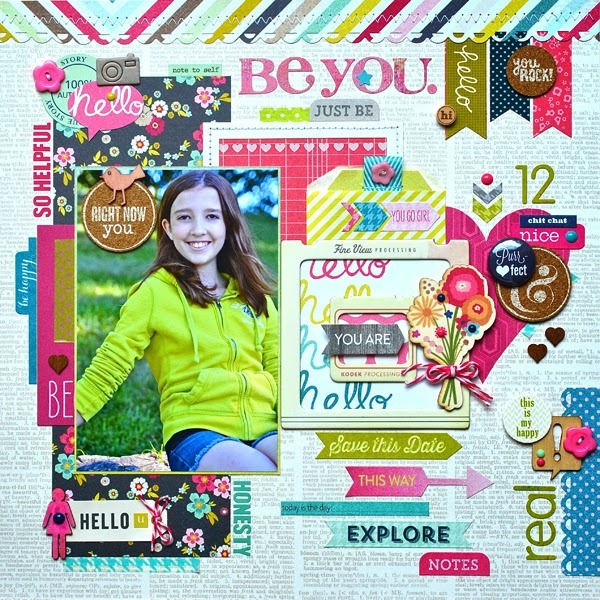 Gorgeous layout, love how the Pebbles worked with the MME! ooooo i love the colors = they're perfect and what a cutie she is. Diggin that frame cluster too. This is gorgeous!!! LOVING those bright, bold colors and loving that photo of her!!!!! Such a wondeful layout ! gorgeous! love the added texture of the stitching! Just gorgeous, Lisa!! Your attention to detail is so amazing. love the layering and the photo is so good. Love it lisa!!! And that is such a great photo of her. Such a bright and beautiful page!!! Just beautiful! Love the photo, the colors, and the details! I thought I spied some Pebbles in there! This is fantastic! It all goes together perfectly! I must say your daughter is so photogenic! Awesome job Lisa! What a bright and beautiful layout! Awesome use of the MME, Lisa!! Love how bright and happy this page is! Lisa, I am so in love with your style! You are such a master! I love this! This is super. Love everything about it. What a fun and happy page! WOW! Lisa this is a great layout of your daughter. Love how you used this line. So fun!